Girly Girl Giveaways: Giveaway- American Brownie Co. Some of my favorite reviews involve chocolate. And the American Brownie Co. did not disappoint! I will admit that I am somewhat of a brownie freak. They are my absolutely favorite dessert. So when I found American Brownie Co. in a search one day I knew I had to find out just how good these brownies were! After all they do tout that they are not just America's best brownies but the WORLD'S best brownies. They graciously sent me their new Spring Truffle Brownie and Blondie Tower Gift Pack. Now chocolate doesn't last in our house. It is usually gone pretty quick! 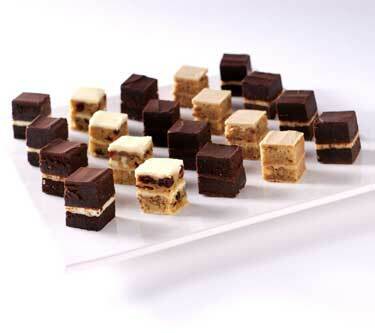 But these amazing pieces of decadence lasted us quite a bit because one perfect square quenched my sugar craving. They are flavor-packed, chewy and delicious! I ended up deciding that I liked letting my brownie come to room temperature before enjoying because it just melted in my mouth more (they have you keep them refrigerated to retain flavor and so they last longer because to be honest they're so rich and delicious that one is enough!). 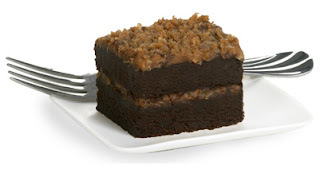 So yeah, I want to try this German Chocolate Brownie sometime! The flavors in my sampler were: Chocolate Raspberry, Cherry Walnut Blondie, Dark Chocolate, White Chocolate Walnut Latte Blondie and Chocolate Peanut Butter. My favorite ended up being the White Chocolate Walnut Latte Blondie. It had this amazing "Coffee Latte Ganache" in the middle and on top. *SWOON* I also really really liked the Chocolate Raspberry. I didn't try the cherry one as I'm not a huge cherry fan but my kids loved that one! Others who tried the brownies also loved the latte blondie as well. One reader is going to win their own Spring Truffle Brownie and Blondie Pack in honor of Mother's Day, a $28.99 value! *If you do not win do NOT forget to grab up a box of these absolutely amazing brownies for yourself or for your momma! It is so worth every last cent. This company earned the right to call themselves the best. So go ahead and treat yourself or someone you love! Visit American Brownie Co and tell me about a brownie that makes you drool OR about one fact about the company! One comment allowed only please. OPEN TO USA ONLY due to the weight of shipping! All opinions expressed herein are entirely my own; I was not compensated for them. I did receive a product to review which did not bias my opinion. Thank you American Brownie Co. for this opportunity! Triple Peanut Butter Blondie--OH YUM!! The Double Stack Gourmet Blondie looks yummy. Actually all these brownies look yummy. I am publicly following you! I am drooling over their delicious looking Chocolate Peanut Butter brownies and have my ice cold glass of milk just waitng. I follower through Network Blogs. The Ooey Gooey Turtle looks right up my alley... I'd stick it in the microwave for a few seconds- YUM! Mmmmmmm . . . the cappucino brownie sounds wonderful! Double Stack Gourmet Blondie mmmmm!!! I think the chocolate espresso brownie looks fantastic! oh my goodness....how do I choose?? ooey gooey turtle and german chocolate would probably be my top picks. I am drooling over the blondies. Yummers! The Dark Chocolate Malt sounds so amazing! The Triple Peanut Butter Blondie and the Dark Chocolate Malt both look delicious! I'm following publicly via Google Friend Connect. The choclate raspberry sounds soooo good. Mmmm, I would LOVE to try the chocolate peanut butter brownie! My favorite is definitely the Ooey Gooey Turtle brownie. Thanks for the giveaway! Ooey Gooey Turtle Brownies make me drool! I follow Girly Girl Giveaways publicly via Google Friend Connect. I AM A RASPBERRY JUNKIE!!!! I would love the Raspberry Liquor Brownies!